Cliches apart, there could not have been a more timely book than Shadow Armies: Fringe Organizations and Foot Soldiers of Hindutva. It puts all the things happening in Indian politics in to perspective. Bit by bit, it explains the reasons behind the rise and rise of Hindutva politics over the years, with all its landmark victories as well as contradictions and intra- and inter-organisational conflicts. It ably traces the trajectories of Hindutva outfits across the country. The chaotic anti-minority and secular environment in its crude form, as we are witnessing today, is the result of a concentrated effort of several decades. In this book Dhirendra K Jha profiles eight organisations, directly and indirectly, linked to the fountain head of Hindutva in India, the Rashtriya Swayamsevak Sangh (RSS). The senior journalist had earlier co-authored the critically acclaimed Ayodhya: The Dark Night – The secret history of Rama’s appearance in Babari Masjid. These organisations are, Bajrang Dal, Rashtriya Sikh Sangat, Bhonsala Military School, Hindu Aikya Vedi, Sri Ram Sene, Sanatan Sanshta, Hindu Yuva Vahini and Abhinav Bharat. While first four directly work under the direct supervision of the Sangh Parivar, a loose yet a formal network of sorts of Hindutva outfits. The latter four operate independently. However, what is important to remember is that they don’t have different goals. One thing which comes out very clearly from the study of these organisations is that they might have different shades, often seemingly contradictory to each other, but their roots and ultimate goals are same.At the end of the day, they all serve the Hindutva ideology. “Some of the ‘fringe organisations’ seem to exist outside the purview of the Sangh Parivar in so far as they are not technically created and controlled by the RSS. Prominent among them are the Sanatan Sanstha, the Hindu Yuva Vahini, the Ram Sene and the Abhinav Bharat. Yet they are not entirely autonomous. Most of them have an umbilical cord attached to the Sangh Parivar, and all of them are ideologically on the same page. Like the RSS and its affiliates, they claim to derive their ideological raison d'etre from VD Savarkar’s Hindutva: Who is a Hindu?” notes Jha. The rise and fall of the Ram Sene is the best example of it. The making of Ram Sene, Jha’s research reveals, was a coming together of people sidelined by the Sangh Parivar, namely the Bajrang Dal. According to the author, while Pramod Muthalik, the face of Ram Sene came because of a highly personalised fight within the Parivar, his henchmen (mostly belonging to the backward castes) such as Praveen Walke, Arun Kumar Puttila, Prasad Attavar, Anand Shetty and Subhash Padil joined it due to resentment, given the brahminical dominance of the RSS and BJP. “Till 2004 we didn’t feel any brazen discrimination on caste lines,” Jha quotes Walke, who was at that time the state of convener of Bajrang Dal. “But once the Assembly election results that year showed the task was complete,” said Walke stating that “caste became our handicap in the organisation which keeps all its important positions reserved for brahmins”. The chapter on the Ram Sene also ably demonstrates insecurities and vulnerabilities of foot soldiers of Hindutva. There is a fascinating story about the Bajrang Dal, explaining its political economy in the city of Mangalore, arguably the biggest urban centre of Hindutva politics, not just in Karnataka but the whole of south India. Jha shares with us a telling story of Sharan Pampwell, the Mangalore-based leader of Bajrang Dal and the proprietor of Eshwari Manpower Solutions Limited. “Like a good entrepreneur – obeying the laws of demand and supply – he has put to good use the anxiety felt by local businessmen as a direct result of the Bajrang Dal’s activities,” writes Jha. “He offers them protection by using the foot soldiers of the very same Hindutva outfit he represents. The enterprise he has reared thus works both ways; the businessmen get security from the Bajrang Dal, and the Bajrang Dal activists benefit from regular employment in the establishment rendered venerable by their own acts of violence and hooliganism” he explains. Predictably, most of his clients are Muslim, the prime target of Bajrang Dal. 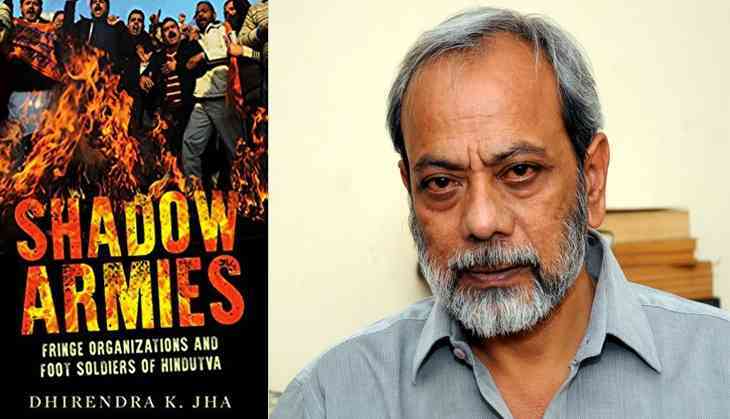 “Given the kind of activities they (the Bajrang Dal members) indulge in, this is the best way to do your business peacefully,’ Jha quotes a Muslim shop owner, explaining the rationale. The story of Hindu Yuva Vahini (HYV), which was led by the current Uttar Pradesh Chief Minister Adityanath, deserves special attention. His steady rise is a direct result of the success of HYV’s ground work in the state, especially in its eastern parts. “Right from its inception, the HYV ran an aggressively toxic campaign into full-blown communal wars and projecting minorities as the enemies of Hindus. It constantly sought to create a fear psychosis by emphasising ‘love jihad’, the meat-eating ‘habits’ of Muslims, their ‘propensity to violence’, their ‘deliberate disrespect’ of Hindu rituals and national symbols, their ‘tendency to dominate when in a majority’ anywhere, etc,” writes Jha. It was no surprise, what we saw in terms of UP Assembly results and Adityanath’s selection as the CM was a reward of donkey's years of work on the ground. Jha rightly notes in the book that the trouble sowed by the HYV through its utterly communal acts and speeches eventually paid electoral dividends. He has also pointed out to the leniency practised by the state apparatus to pave the way for Adityanath's success. “It is not surprising that despite being named in a number of FIRs, Adityanath’s name hardly ever figures in any charge sheet filed by the police after the investigation,” remarks Jha. “Every time Adityanath or any HYV member figures in an FIR, a CB-CID inquiry comes to their rescue. This has remained a standard pattern in Gorakhpur. So far the local officials conducting CB-CID probes have not disappointed Yogi Adityanath,” reveals the author explaining the connivance of the state governments. What is remarkable about the book is that, despite the author’s personal dislike for Hindutva politics he avoids judgement. Jha is dispassionate in his approach and relies solely on thorough research and instead of putting words into the mouth of the foot soldiers, he lets them speak. It is a perfect example of “Show, don’t tell” technique of writing. It is a must-read book to understand the politics of our times.